Fetu-Afahye Festival is celebrated by the Oguaa people of Cape Coast. It is celebrated annually every September. It is noted for its colorful nature and the celebration atmosphere it generates. 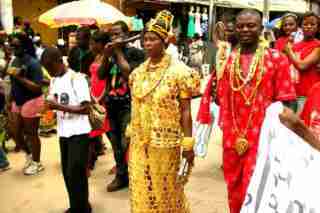 the Central Region is also home to a great cultural blend and festival celebrations. Among these festivals is the Fetu-Afahye. As with every other festival in Ghana, there is a great history behind the celebration of the Fetu-Afahye Festival. It is said that during the days of their ancestors, there was an outbreak of a disease among the people which killed a lot of people. They prayed to their gods, and as history has it, the gods helped the people to eradicate the disease. Thus the name “FETU”, which in the local dialect means “Efin Tu” (dirt cleansing). One can therefore say that the festival is about keeping the town clean and preventing a repeat of the epidemic that befell their ancestors. 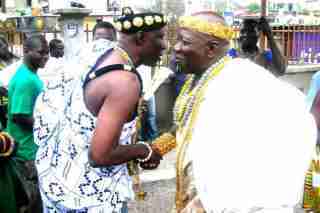 Before the actual celebration, the paramount chief of the Ogua Traditional area, the Omanhene, goes into confinement for a week. This is to enable him meditate with the gods, and seek guidance for the people. He also takes care of his health, by seeking medical attention, to ensure that he is fit for the celebration. Before the celebration, a ban is imposed on drumming, dancing and noise making within the municipality, and a ban on fishing in the sacred Fosu Lagoon. This is to create a peaceful atmosphere for the festival to be a success. There is a prayer and cleansing ritual by the “Amissafo” who are the caretakers of the sacred Fosu Lagoon. They pour libation at the Lagoon to cleanse the people from any bad omen, and pray for a successful festival and bounty harvest in the coming year. They pray for abundance of food crops and abundance of fish for the coming year. Fetu-Afahye Festival begins on the last Monday in August. On this day, during the night a vigil is kept at the Fosu lagoon. All the citizens of the town come out to witness a procession of the Priest and priestesses of the town till day break. This is amidst drumming and singing of traditional songs as the priests and priestesses make their evocations for the coming year. The following day, the Omanahene of the Ogua Traditional area pours libation at the estuary of the lagoon and the priests perform rituals at the Fosu shrine. “BAKATUE” is one of the events that herald the beginning of the festival celebration. This is the lifting of the ban on drumming and noise making, and the lifting of the ban on fishing in the lagoon. The Omanhene after casting a net three times into the Lagoon declares the ban lift, and there are cheers, drumming and dancing all over the town as the celebrations begin. Ironically if the Chief’s net catches plenty of fish, they believe that this is a sign that there would be plenty of harvest the coming year. The next day the people welcome home their relatives and friends who have moved to other towns. There is a vigil on Thursday at the “Nana Paprat Shrine” from 8:30pm with dancing and pouring of libation, known as “Adammba”. The priests and priestess make incantations’, invoke the gods and foretell the future. This ends with the ushering in of the first “Oman” (state) purification ceremony at the shrine. A bull is reserved for the purification. The bull itself is kept at another shrine, the “Nana Tabiri Shrine” where it is also cleansed before being used. The purification ceremony comes to a climax when the bull is slaughtered. After the Friday purification rites, the people gather at the public square called Papratam, which is said to be the people’s first meeting place. Here the Omanahene sits in state and delivers his annual speech to the people and gives them advice. PROTECT THE PEOPLE AND MAKE THEM PROSPER”. That's the spirit of Fetu-Afahye Festival. After that he takes a knife and slaughters the bull to mark the climax of the celebration. 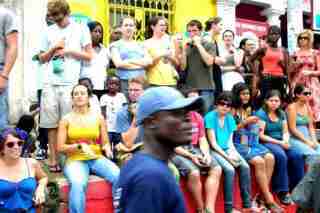 There is parade along the streets of cape coast, the Asafo companies (traditional guards), also showcase their art and there is merry making with singing and dancing all over the town. Ironically, there is a church service on Sunday to thank the almighty God for a successful celebration. This is the Fetu-Afahye Festival............ Welcome Home.